Our parent-involved school is an educational community in which the parents and teachers work together to provide an optimal environment for the children. What do we mean by Parent-involved? Our parent-involved school is an educational community in which the parents and teachers work together to provide an optimal environment for the children. At PONS, the cooperation between families and the school creates a spirited community and an opportunity to "join in" - to participate and make friends with other families while maintaining a preschool. We recognize that family life is extremely busy; however, we feel that it is crucial to the success of our school that families participate in some way. Within the classroom at PONS, parents or primary caregivers provide the daily snack and are encouraged to stay on their child's snack day. Classroom participation is a wonderful opportunity to observe your child with his or her peers and learn from the experienced teachers about child development and behaviors. PONS is administered by a Board of Directors which includes a group of parents elected annually. All parents are invited to attend the monthly board meetings. The board sponsors many activities for families, including our Fall Family Festival, parent speaker nights, and an open house. It is a great way to meet people and be involved in a community of families with young children. My child has allergies. Is PONS a nut-free school? Yes, PONS is an entirely nut-free school, and parents providing the daily snacks are made aware of this. Extra, allergy-safe snacks are kept on hand, as needed. Parents whose child have a non-tree nut food allergy should make staff aware in advance, and also provide their child's own safe snacks each day. Does PONS have summer camp? Yes! For several weeks in June and July, PONS offers a 9:00am-12:30pm session of camp for ages 3-6 that is full of art and outdoor activities. Could my child join the others for lunch on a half-day? Yes! At PONS we have a program called "Lunch with Friends", where for a small fee per occurrence, parents may sign up their child to come and enjoy a midday meal at school. Morning session children may stay until 12:30pm. Alternately, afternoon session students may arrive at 12:00pm and enjoy lunch with their classmates. Meals are not provided by the school, and therefore all children must bring a lunch from home that meets the school's allergy requirements. The teachers also ensure that no sharing of food is allowed at this meal, due to allergies. The school does have a microwave and can reheat food for the student, if desired. Does my child need to be potty-trained to attend? Yes, like most preschools, your child should be well on his or her way to being fully potty-trained. Our teachers are supportive and help guide your child in proper bathroom cleanliness: hand-washing, etc. Our handbook outlines the basic rules we ask our families to follow while they are at PONS. Download our handbook here. Pine Orchard Nursery School is currently enrolling students for fall 2019! 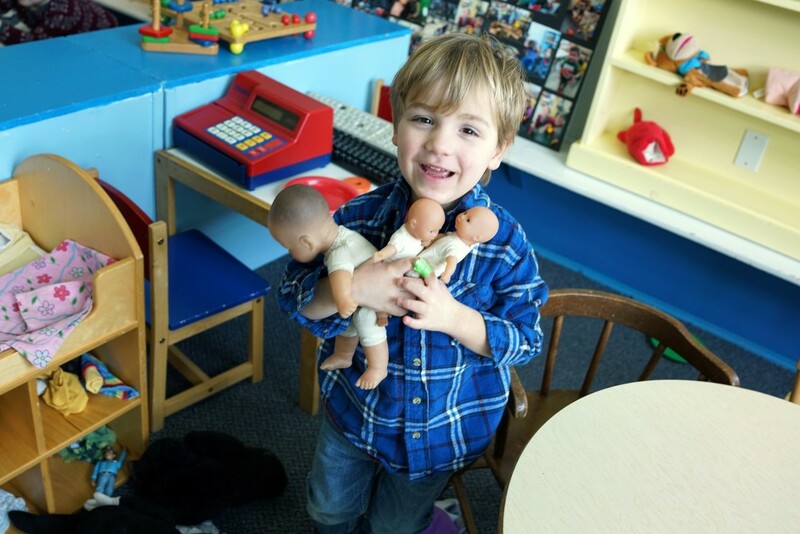 We offer preschool Classes for 3, 4, and 5 year olds with morning, afternoon, or full-day options. Please call us at 203-488-3769 for further information. For those in the process of registering, download our registration form and health form here.